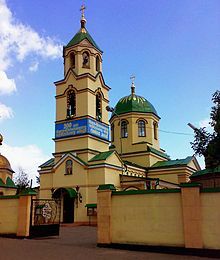 Alchevsk (Ukrainian: Алчéвськ, translit. 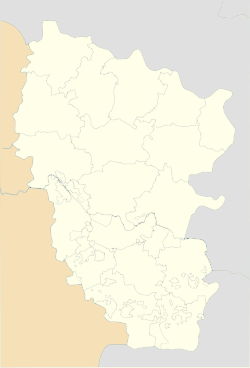 Alchevs'k; Russian: Алчéвск) is a city of oblast significance of Luhansk Oblast (province) of eastern Ukraine. It is located approximately 45 kilometres (28 miles) from the oblast capital, Luhansk. Population: 109,377 (2016 est.). Alchevsk is one of the largest industrial centers in the Donbass, and comprises a quarter of the entire oblast's production. The city economy depends on OJSC "Alchevsk Iron & Steel Works" (a trade blockade by Ukrainian activists during the War in Donbass has all but halted production of this plant in February 2017) and "Alchevsk Coke-Chemical Plant" companies. 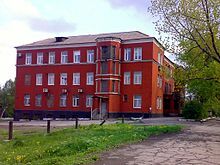 The city was known as Voroshylovsk (Ukrainian: Ворошиловськ) from 1931 to 1961, and then Komunarsk (Ukrainian: Комунарськ) until 1991. 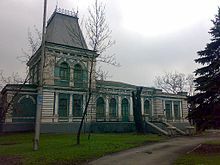 Alchevsk was founded in 1895 with the establishment of an iron works and named after the Ukrainian industrialist of the Russian Empire Oleksiy Alchevsky who founded the Donetsk–Yuryev Metallurgical Society. He was famous for the financial and industrial development of the eastern part of Ukraine and particularly the Donbass region. Later his children as well as his wife made enormous contribution in the development of the Ukrainian culture through poetry and music. In 1931, Alchevsk was renamed Voroshilovsk, after Kliment Voroshilov, a Soviet military and party figure. As Voroshilov's personality cult was diminishing, the town was renamed Kommunarsk in 1961. After the dissolution of the Soviet Union, the original name was restored in 1992. On January 22, 2006, the district heating system of the city almost entirely collapsed after an underground heat pipe line cracked in unusually cold weather (nearly 7002243149999999999♠−30 °C). As a result, heating equipment in the majority of Alchevsk's buildings was frozen and ruptured, leaving about 60,000 residents with only the protection of individual electric heaters. A few days later the sewage system also froze due to a lack of warm tap water. An investigation revealed the massive, long-time negligence of the city authorities. The whole heating system was designed in a hyper-centralized way, depending on only two boilers and few main pipelines. Moreover, the housing company failed to react to the pipe incident properly: the water from the system wasn't immediately dumped to prevent further freezing. The Ukrainian government took massive emergency actions to protect Alchevsk residents from freezing. Engineering teams sent by cities and industrial companies from other regions of the country were gradually restoring heating appliances in every apartment affected. Hundreds of children together with their schoolteachers were evacuated to the resorts and hotels in the warmer regions of Ukraine. According to the governor of Luhansk Oblast G. Moskal, it has been the worst human-made disaster in the history of independent Ukraine. Starting Mid-April 2014 pro-Russian separatists captured several towns in Luhansk Oblast, including Alchevsk. In the following war in Donbass, the city became a part of the separatist Luhansk People's Republic. The main branches of Alchevsk industry - metallurgical and chemical. Electromechanical, light and food industry is also developed. Currently the city has 17 industrial enterprises. 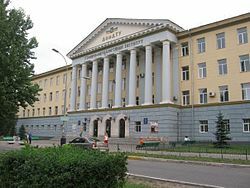 The Donbas State Technical University founded in 1957 is located in Alchevsk. Alchevsk is home to the football team FC Stal Alchevsk which currently participates in the Ukrainian First League,the second tier of national football competitions. ^ "Численность населения по состоянию на 1 октября 2015 года по Луганской Народной Республ ике" (PDF) (in Russian). Luhansk People's Republic. Archived from the original (PDF) on 4 February 2016. Retrieved 21 December 2015. This page was last edited on 25 November 2018, at 23:11 (UTC).